Works with (and requires) Arduino software version 1.0 or later. Easy configuration (documented below, reference in the makefile itself). 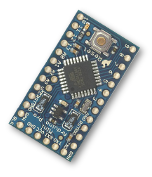 Automatic mode: drop-in replacement for the Arduino IDE. Manual mode: specify all source files and build parameters manually. Detects used Arduino libraries and includes them. Supports local (project) libraries and Sketchbook libraries. Simple (crap) detection of attached Arduino. Reads board parameters from boards.txt. Can upload to an Arduino. Serial monitor function (like the IDE). Can burn the bootloader to your board. Tested on GNU/Linux, OS X and (less so with) BusyBox on Android! Or you can just download it and unpack it from arduino.cc. If you do, it is suggested that you unpack it to ~/opt/arduino where it will still be automatically detected. On OS X, you should put the Arduino.app in either /Applications or ~/Applications. There are a several environment variables that affect how the makefile works. You can look in the makefile its self for a complete reference, but I’ll mention a few now that you might need to set to get started. ARDUINODIR is the path to where you have installed the Arduino software. BOARD tells the script what type of Arduino you want to build for and upload to. SERIALDEV is the POSIX device name of the serial device that represents your attached Arduino. Note: for a complete list of available board names, type make boards. There are two ways to use the makefile. If a project directory contains a .ino (or .pde) file, the makefile works in an “automatic” mode. If you want to be able to override or set some variables in the makefile, you can also create your own Makefile (as mentioned in the previous section) and include arduino.mk from there. These latter two approaches have the benefit that you can update the Arduino makefile once and all projects benefit. OK, so assuming BOARD (and ARDUINODIR) are set up correctly, you probably only need to type make to build your project now. And if SERIALDEV is correct, make upload will upload it to an attached Arduino! Note, there can be only one .ino (or .pde) file per project directory (more than one will cause an error). So if you want to split development in to other files, make the other files .c, .cc or .cpp files (which are automatically included in the build). Also note that for compatibility with the Arduino IDE, you main .ino file is supposed to have the same name as the project directory. If your project directory doesn’t contain a .ino (or .pde) file, you must specify the build parameters yourself. In particular, you’ll need to specify SOURCES and any used LIBRARIES. You would do this, typically, in your own Makefile, which would then include arduino.mk. If your project was written for one kind of Arduino in particular, you might also want to specify BOARD here, as well. Note that you will have to manually #include <Arduino.h> in main.cc in the above example. That header is not automatically included, as would be the case if it were a .ino file. There are a few other environment variables you might need to know about which I will include here for completeness. The makefile its self is a good reference for all variables. ARDUINOCONST specifies the value of the ARDUINO constant that is set at build-time. This defaults to 100 if unset, but you can override it. AVRDUDECONF is the fully-qualified filename of the avrdude.conf file for avrdude. Again, the makefile tries to make some sensible guesses about its value, but you can specify it yourself. AVRTOOLSPATH is a space-separated list of directories that the makefile will look in to find the avr build tools. It defaults to your environment’s PATH, followed by a couple of subdirectories in ARDUINODIR. If this is not sufficient, you can specify it yourself. AVRDUDEFLAGS, CPPFLAGS and LINKFLAGS allow you to specify additional command-line arguments to avrdude, the compiler and the linker, respectively. The makefile will append its own stuff to the end of these. LIBRARYPATH is a space-separated list of directories that is searched in order to find #included libraries. It defaults to “libs” and “libraries” in your project directory, and then “libraries” in your Sketchbook directory and then the Arduino software directory. TARGET can be set to specify the name of the built target. But this is usually entirely unnecessary. boards Display a list of available board types (and valid values for `BOARD`). monitor Serial monitor. Actually, it starts `screen` on the serial device. bootloader Burns any bootloader to the attached Arduino. Thank You!! Great job, it works like a charm on my gentoo distro! Great, I got it working on a Google Nexus 7 (rooted), I needed to make some changes to the Makefile, because of the busybox variants of the commands and some Android layout things. The busybox rm don’t know the -f param, so I deleted this (then it works). But now I can programm my Arduinos from my Nexus 7! One thing: When changing the source (.ino) and then doing a make upload it will not recompile. Is this a wanted thing? Also make all does not upload? Nice. Well-documented, up-to-date, well laid out and complete. Thanks! Just wanted to say thanks for creating such a helpful resource.
. So much nicer to be in vim and the command line rather than the Arduino GUI. Hi Tim. You’ve really done a great job. Congratulations. I’m preparing a tutorial to program an Arduino from a Raspberry Pi using your great Makefile in Spanish. Let you know when you are ready to give your OK.
Let you know when you are ready to give your OK.
Google Translate didn’t like this sentence! If you are asking for my approval, go right ahead! :o) I’d be interested to see it when it’s finished. Send me a link! Beautiful work, thanks guys, you are awesome ! Ahh,thank you! You are awesome! BTW – thanks for putting this together. I’m a vi & command line guy and the IDE was too klunky for my needs. Awesome work! I have used this many times now, and it beats the Arduino IDE, no contest! Love the easy monitor. This makefile allows you to use a proper development environment for developing on the Arduino. Really good work. I needed to make changes for makefile to work with Arduino IDE 1.6.4 and possibly newer. I had to edit the file “arduino.mk” and replace all “/hardware/arduino/” with “/hardware/arduino/avr/” and replace “$(HOME)/.arduino” with “$(HOME)/.arduino15”. After these two replacements, I had no problem using the makefile. There is probably a better way to do this that is more generic, but I used this quick fix and thought it may be useful to others. I don’t have the fix for the $(HOME)/.arduino15, though. I’ll have to implement that — thanks! Very nice! I wanted to make use of the Arduino libraries but found the IDE horrible and limiting, also I wanted to use .S files, which are not supported by the Arduino software. A very quick change adding additional *.S wildcards to the SOURCES line and it just works. Thanks!